In TRAVELS WITH EPICURUS: A Journey to a Greek Island in Search of a Fulfilled Life (Penguin, $20), Daniel Klein follows in the footsteps of another intellectual giant. The 73-year-old Klein plants himself on the island of Hydra on a quest "to figure out the most satisfying way to live this stage of my life." Klein comes armed with a copy of the Greek philosopher Epicurus' "Art of Happiness," which views old age as the "pinnacle of life" and urges those in their later years to slow down, surrender their competitive instincts and savor the joys of being alive. Sitting on the terrace of a taverna and meandering up steep mountain paths, Klein easily adjusts to the Epicurean rhythms of rural Greek life: "Moving slowly has a grace to it that I find I can easily settle into. I feel fluent in slow motion." He mocks the "forever young movement," the tendency of many people to cling to their youth through breast implants or testosterone patches, and advises them not to dwell on the prospect of what he calls "old old age," when the body and mind disintegrate. "Perhaps authentic old age," he writes in this often insightful meditation, "can consist of neither the breathless ambition of the forever youngster nor . . . unremitting despair . . . but something meaningful in itself." 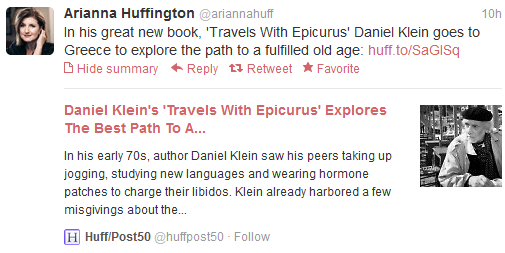 Daniel Klein is a wonderful writer, which he proves again in his Travels with Epicurus. The setting of the book is the Greek island of Hydra. Daniel (who is in his 70s) travels to the island to contemplate aging and the meaning of a well lived life. His companions on this trip are several philosophers, chiefly Epicurus. Along the way, he interacts with the older members of the Hydra community and reflects on their needs and wants as they age and compares them to his own life. He extols the virtues of friendship and conversation, such as Epicurus made key to his prescriptions on living well. As a philosopher, Daniel has wide ranging interests and pulls in many different strands of thought of well known writers from Plato to Kierkegaard (and less well known like Lars Svendsen), but always comes back to the thoughts of Epicurus and his philosphy of living. This book will not give any new theoretical insight on the philosophers discussed. What it will give you is an inside look at how an accomplished writer contemplates growing old and how the life affirming philosophy of Epicurus encourages him to enjoy the fruits of a well lived life. 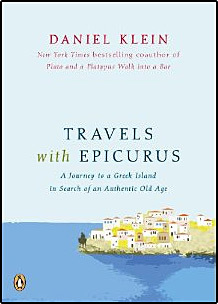 Travels with Epicurus: A Journey to a Greek Island in Search of an Authentic Old Age by Daniel Klein. What a treasure of a book! This is a humorous and uplifting meditation on ageing. Seventy-something-year-old Daniel Klein travels to the Greek island of Hydra with a number of books tucked under his arm, including the philosophies of Epicurus, seeking the best way to achieving a fulfilling old age. He discovers to his (and my) delight, that we are at the pinnacle of life, and all our experiences and friendships over the years can now be reflected upon, the striving years are over and we have "docked in the harbour, having safeguarded our true happiness". Klein (Plato and a Platypus Walk into a Bar, 2008, among others) returned to the Greek island of Hydra at age 73. His return had a new and specific purpose: "I want to figure out the most satisfying way to live this stage of my life." Prior experience with the island led to conclude that the "old folks of Hydra have always struck me as uncommonly content with their stage in life." But just observing and absorbing what the people had to show and tell him didn't seem like quite enough. To augment his on-site learning, he took with him a stack of philosophy books by ancient Greeks as well as some modern writers. It's an interesting formula, resulting in a lovely little book with both heart and punch, an argument against the "forever young" syndrome so prevalent in contemporary American society. His contemplative time spent observing the old men of Hydra while reading his small library of the great thinkers led him to an "evolving philosophy of a good and authentic old age." --Brad Hooper . Following a trip to his dentist, 73-year-old Klein considers his options after being advised that he needs tooth implants or a denture. Klein (Plato and a Platypus Walk into a Bar) opts for a sojourn to the Greek island of Hydra. Accompanied by a suitcase crammed with philosophy books, Klein contemplates the Greek philosopher Epicurus' pivotal question. "He fundamentally wanted to know how to make the most of his one life," writes Klein. Eschewing the "forever young" treadmill many American's embrace, Klein explores a different path, examining the relaxed Greek lifestyle surrounding him. He laments what's lost in the frantic rush to stay youthful: "And we have no time left for a calm and reflective appreciation of our twilight years, no deliciously long afternoons sitting with friends or listening to music or musing about the story of our lives." The author ruminates on the benefits of freeing ourselves from the prison of everyday affairs; the pleasures of companionship in old age; battling boredom; the difference between sexual urges and sexual nostalgia; and the value of facing death blissfully. Along the way, Klein touches on the ideas of Bertrand Russell, Erik Erikson, Aristotle, and William James. Klein's narrative is a delightful and spirited conversation, offering up the ingredients inherent to the art of living well in old age. A late-in-life reflection and modern-day philosophical exploration of what it means to age authentically. Septuagenarian Klein (co-author: Heidegger and a Hippo Walk Through Those Pearly Gates, 2009) is on a personal quest to redeem the grizzled and gray-haired among us. Returning to the Greek island of Hydra, which he visited in his youth, he sought to watch and learn from a culture that, he writes, best embodies the grace of old age. Over leisurely glasses of retsina at the local tavern, he observed the "lived time" of his aged, Greek friends and lamented the contemporary Western desire to extend the prime of life beyond its course. What do we lose, he asks, when we deny our hard-earned senior citizenship and opt instead for implants, Viagra and a second career? With the ancient Greek philosopher Epicurus as his guide, Klein navigates a veritable sea of great thinkers and their treatises on aging. From Aristotle to Frank Sinatra, each philosopher offers a different take on what it means to live a meaningful life in one's later years. For Epicureans, it's a life devoted to simple, enduring pleasures and free of pain, particularly the pain we incur on ourselves by pursuing certain pleasures. As it turns out, there are no specific rules to living life well or to making peace with old age, but Klein suggests that perhaps the act of asking can be "some kind of end in itself." Some readers, especially younger readers, will reply in the affirmative when Klein wonders aloud if he is simply "a befuddled old geezer barking at the moon." Others will appreciate the slow, lighthearted amble of his discourse and the wise cast of characters that inhabit his journey. Charming and accessible, this philosophical survey simply and accessibly makes academic philosophy relevant to ordinary human emotion.